A beautiful young woman sits patiently on a window sill. Her legs are comfortably crossed while she leans against the windows edge. Her back feels cold against the glass, but she doesn’t notice the chill. In her hands, she holds a large and very old hourglass. An hourglass is a device used to measure the passage of time. It has two glass bulbs connected vertically by a narrow neck that allows a regulated trickle of sand from the upper bulb to the lower one. ‘It won’t be long now’, she thinks to herself. She knows the time has come, and soon she will be able to turn the hourglass around. ‘Only a few more grains of sand, only a few more minutes and I will be able to say goodbye’, she whispers out loud. 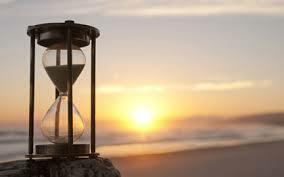 All that is left of her old life and the destructive patterns that have held her prisoner in her misery for far too long is being measured now by just a few grains of sand in the top bulb of her precious hourglass. A very dear and treasured friend once gave her the ornament that sits on her lap. Gone are the days of sadness, anger, and despair, as the last few grains of sand make their way to the bottom of the glass enclosure, the beautiful woman no longer holds the sullen pout on her face, and with a joyful heart she repeats a prayer.